Today we’re chatting all about the backyard and how we’re taking some steps to get closer to our exterior goals this year! 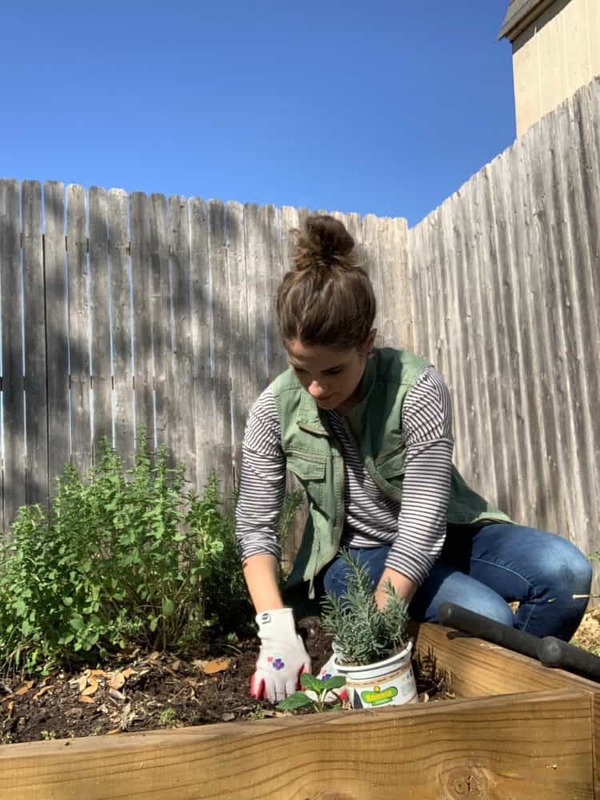 Look at me – another post about freshening up in the yard and actually attempting to show some love to the exterior of our home. I feel like I need a medal. Or at least a cookie. Or, you know what’s even better? A giveaway. Let’s celebrate with one of those. Read to the end of the post to see how you can win $300! (I’m doing a happy dance over here for you). But, I digress. You may know that outdoor maintenance is a struggle for me. I’m a mess when it comes to yard care, and I’ve never been great at making the outside of our home beautiful. But, every year I try a little harder and learn a few new things, and this year is no different! 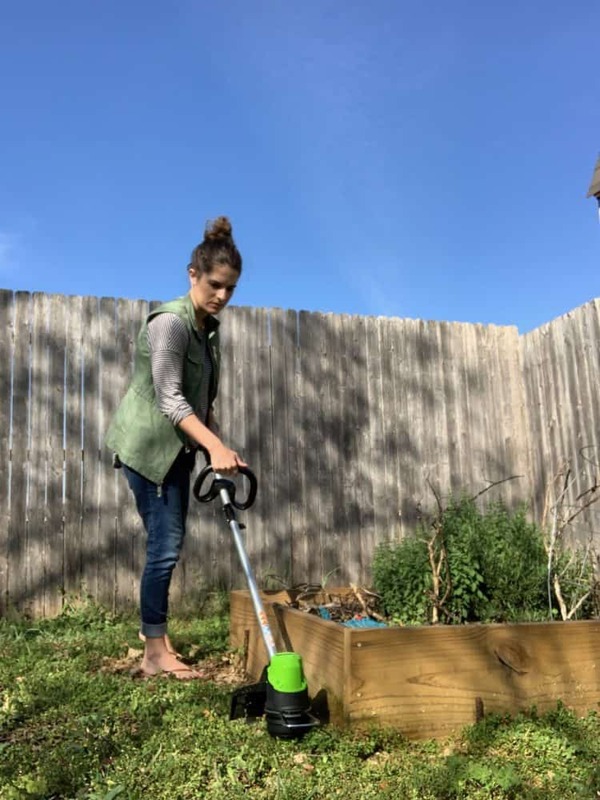 I already shared with you a few things that we did last month to prepare our yard for spring, and now that spring is in full swing around here, I wanted to give a little update on what we’re doing now to work towards our goals. Our garden wasn’t one of our three goals for the exterior this year, but we had so much fun with it last year that I really wanted to at least try a few different things again this year. I’ll warn you that there’s really no rhyme or reason to my gardening methods .- I’m basically a little like a toddler playing around with different combinations until I find something I like. 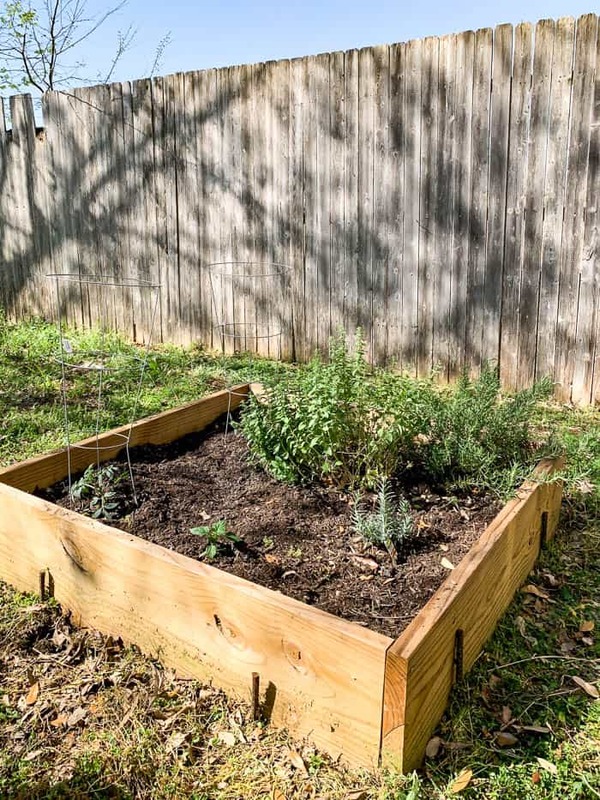 I’m excited to get started on a few different freestanding planters out here, but first I wanted to whip our garden into shape and get a few other maintenance things taken care of so the yard is ready for some updates. Because, when your garden looks like this, it should probably be your number one priority. This post is sponsored by Greenworks, but all opinions and ideas are 100% my own. Thanks for supporting the brands that support Love & Renovations! Whoops. How’d we let that happen?! 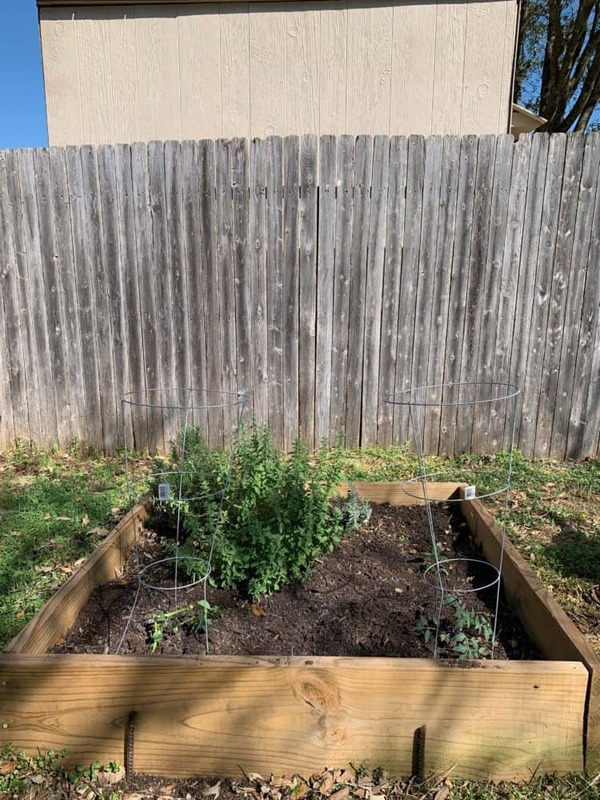 Now that our weather is consistently warm enough to sustain a garden, it was high time I did something about the tangly mess that our garden turned into over the winter. 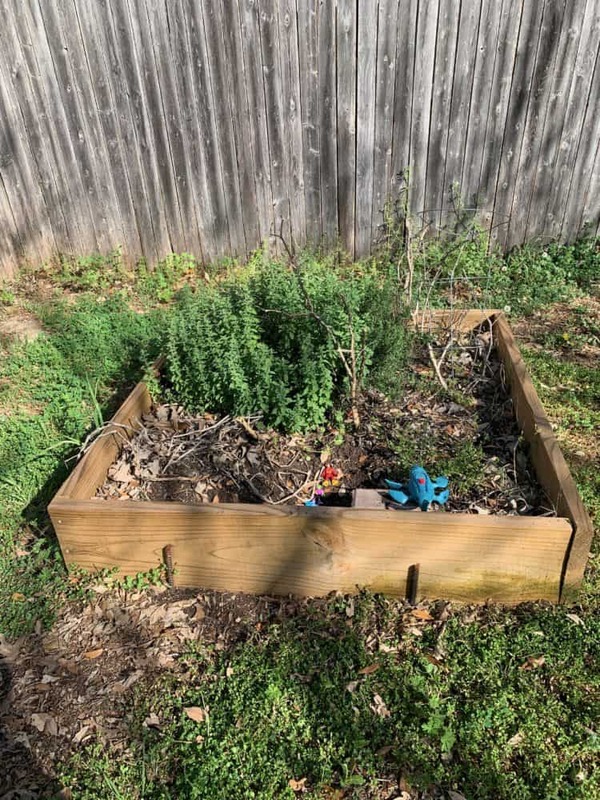 But first, can we acknowledge that the giant green growth in the center is the oregano that refused to grow all year long and suddenly took over everything once I started ignoring it? What is that? Why? Is this normal?! It was completely dwarfing the rosemary which also decided to grow once I stopped paying it any attention, so my first order of business was clearly to clean up a bit. I have been regularly mowing the lawn for a few weeks now, but one task I hadn’t taken care of was weed-eating. Would you laugh at me if I tell you that I’ve always been a little afraid of the string trimmer? There’s just something so powerful and noisy about it, and they intimidate the heck out of me. I’ve never had a problem with mowing the lawn, but I usually save all of the detail work for Corey because I have never liked pulling out the string trimmer. 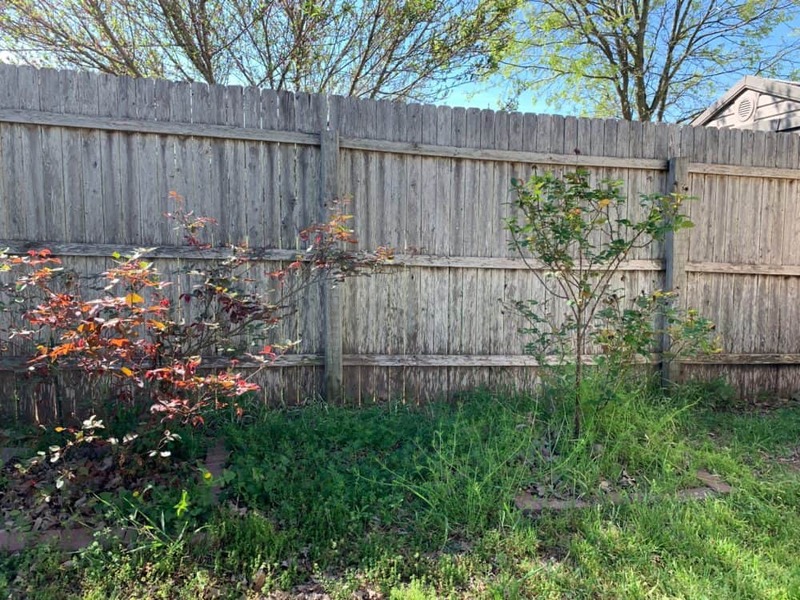 But, it’s hard for him to find time to take care of the yard (since all of the time he isn’t at work usually gets filled up with other things – ahem, bathroom renovation) so it’s much easier on everyone if I just do it. Well, thankfully, I don’t have to be afraid anymore. 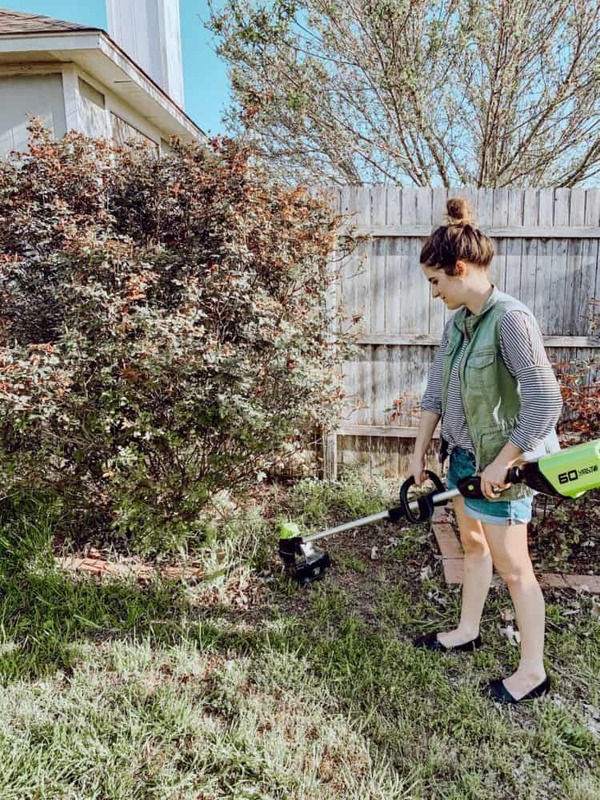 Greenworks sent us a new string trimmer for our yard this year and, y’all! I put it together by myself! I used it by myself! I wasn’t scared at all. It’s not as loud as most of the models we’ve had in the past, it’s much lighter-weight, and I feel like I can actually control it. There was nothing intimidating about it at all, and it felt so nice to be able to actually take care of the yard from start to finish rather than waiting on Corey to take care of the last couple of things. I know. I’m totally unafraid to use the miter saw, tile a bathroom, or paint my bathtub but the string trimmer is my downfall. Not anymore, my friends. Not anymore. Look at me! So in control. So brave. It’s the little things, y’all. Anyways. The point of that little tangent is that I really needed to clean up around the garden bed before I could plant anything new. It’s hard to mow back there, so the string trimmer was the perfect solution to get me back to a place where it didn’t look like my garden had been totally ignored for half a year. 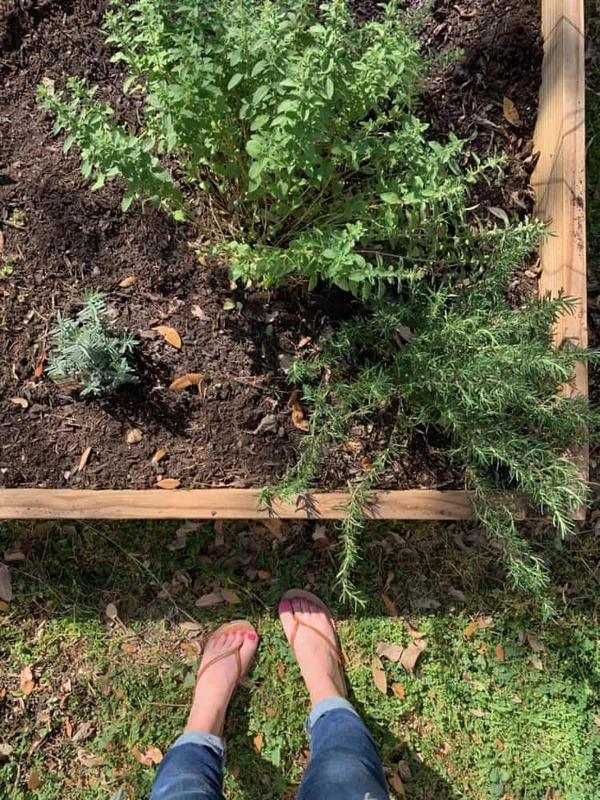 The basic goal is that we want a salsa garden, and then I threw in the lavender because it makes me smile and I figure that’s as good a reason as any to grow it. I’m really excited to watch everything start to grow a bit, and I’m hopeful it’ll be a successful gardening year. Definitely time for the string trimmer, no? I got in there and cleaned things up a bit, and the rose bushes no longer look like they’re being strangled by weeds. A few of them have some buds getting ready to bloom, so I’m really excited to see how they look this year! 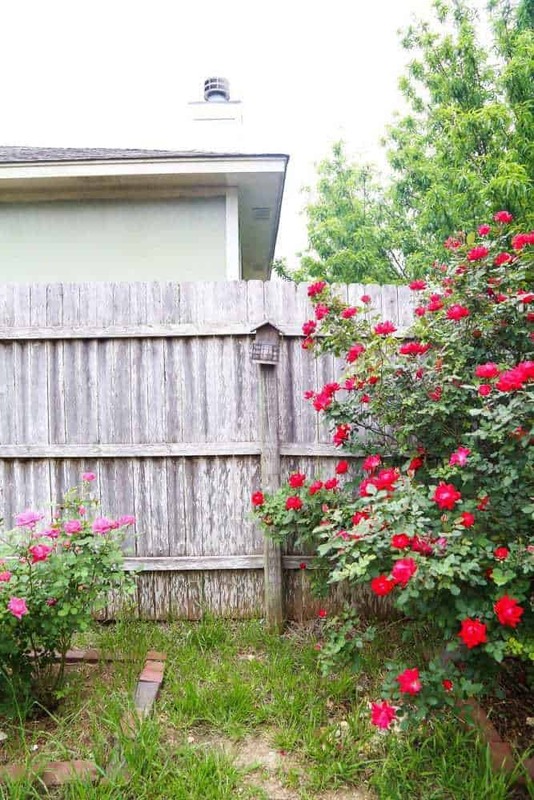 My eventual goal would be to completely revamp this part of the yard so that the brick borders run all along the fence (versus around each individual plant), but . I’m not sure if that’ll be in the cards this year. Side note: Corey relentlessly teased me for the fact that I was wearing normal clothes while I was doing the yardwork. He thought I should be in tennis shoes and work clothes. Just me? Is this weird? Annnyways – what’s next in the yard? I’d like to replant a few things in the front (we need to redo the beds around the trees and the front flower bed), and while we’re at it I want to add some standing planters. UPDATE: We redid the front beds! You can see them here. Then, it’s time to get painting! I want to get the exterior of the house painted before it gets too hot outside, which means I really only have about a month before it needs to be finished. Wish me luck! If you’re doing a lot of yardwork right now (who isn’t?) 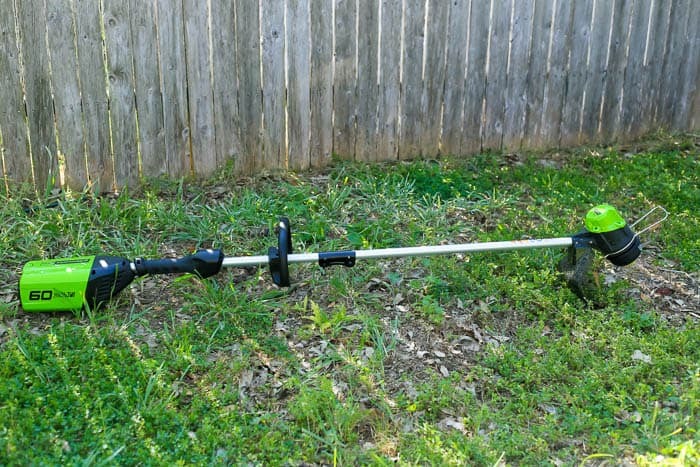 I highly recommend you check out the Greenworks Pro cordless trimmer that we have (ours is the 60-volt). I actually really enjoyed using it (who knew weed-eating was so satisfying?!) and I can promise you our yard will be kept in a lot better shape now that I can do this job on my own! Oh, and I mentioned a giveaway, didn’t I? Don’t think I forgot! Head over to Greenworks’ Instagram page and follow them, then follow the directions in their most recent photo to enter. Three winners will receive $300 gift cards to Lowe’s – and the contest ends tomorrow so be sure to enter today! 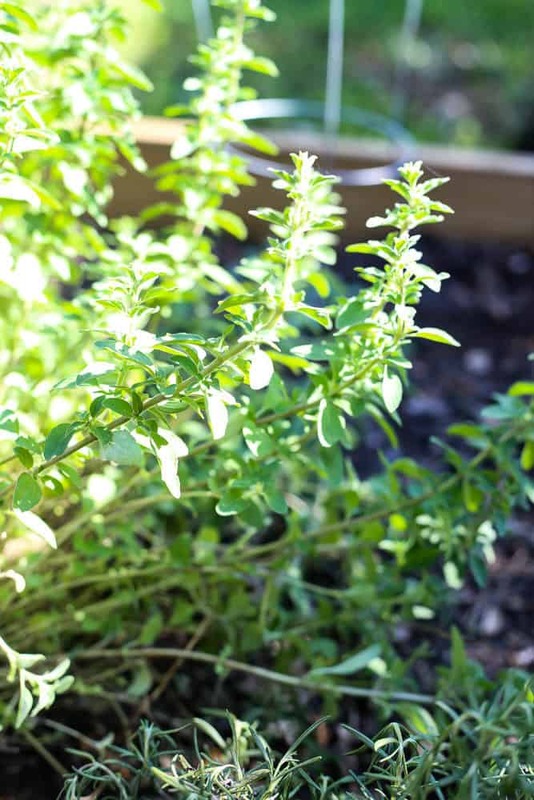 Good luck – and happy gardening! I was wondering if you’ve considered doing a post on things like window washing, screen washing, and washing siding. I really like the guides you do and we’re really doing poorly in the outdoor cleaning department around here! Ugh, I am so jealous of your weather! We just had a dusting of snow yesterday! I had to reread the part about weed-eating, in Canada where I’m from we say weed whacking! I guess we are a little more aggressive when it comes to weeds! Lol! I agree with your husband, shoes that cover your feet like sneakers are a must when mowing or weed eating/whacking! If nothing else it will save your pedicure! We’re having another little cold snap this week, but definitely no snow, haha. We say weed whacking here too – it’s kind of interchangeable haha! I applaud your efforts, but your husband is right or at least partly right? You should never wear flip flops when you weed eat or mow. Even with a guard it’s easy to bounce a stray rock or twig at yourself. Have fun gardening it’s just starting to warm up here in Indiana! I'm Amanda, he's Corey. 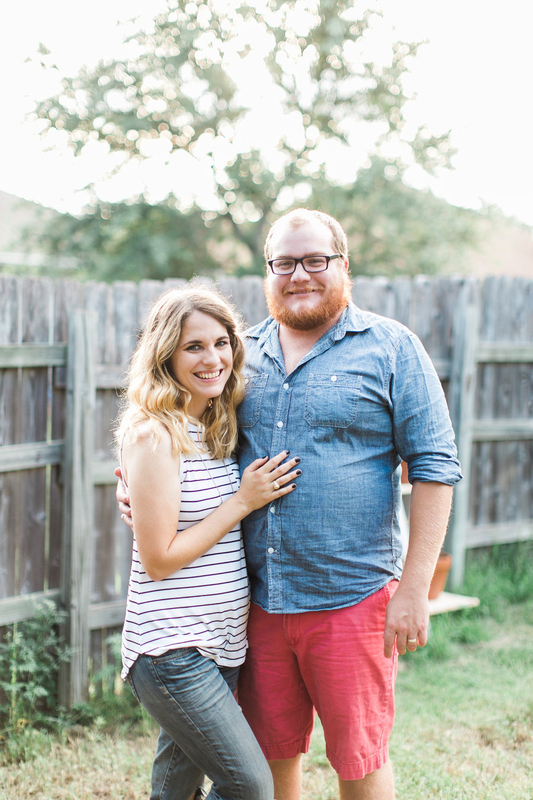 We live in the suburbs of Austin, Texas with our two sons and we love to chat about our home and the projects we're working on. We hope you find inspiration here! Click here to learn more about us. >> Don’t miss all the latest! never miss another post or project.